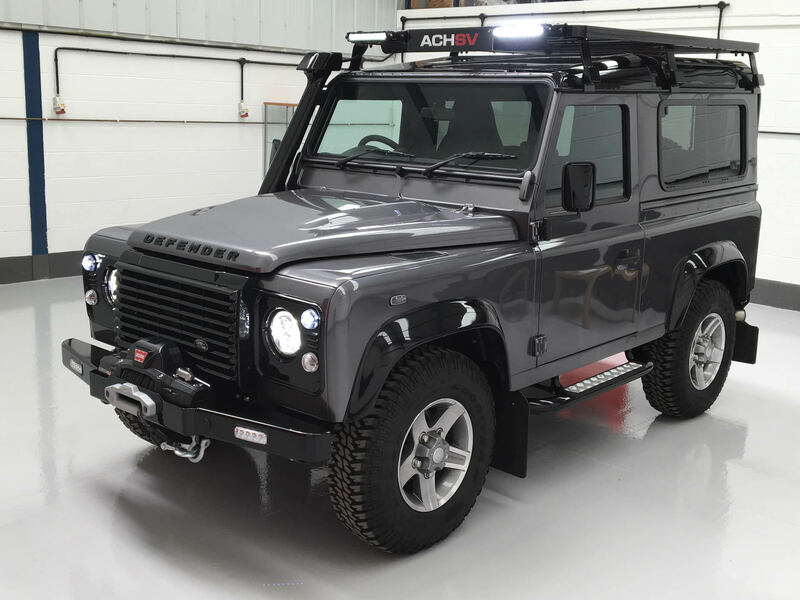 One of the latest Defenders to leave the ACHSV workshop, brand new Defender 110 Utility with WARN 9000-S winch, Safari Snorkel, Steering Guard, Front Runner Full Length Roofrack, Wilderness 40″ double Row Curved LED light, rear LED floods, Mammouth wingtop sill and quarter chequerplates, chassis and body undersealing and BF Goodrich Mud Terrain tyres. This brand new Defender brought to us has had the works, built to the customers specification it’s bristling with extras from top to bottom. The specification on this car includes Chassis and Body Undersealing, where we clean, paint and then underseal all of the metal components underneath the vehicle. The interior was then completely removed and two layers of sound and heat insulation were fitted to every panel to eliminate road noise and stop any panel vibrations. The interior panels were replaced, extra interior LED lighting fitted and extra powerpoints installed int he front and rear. A Full Length Frontrunner Roof Rack was then fitted which allowed two Frontrunner LED Floods to be fitted to the rear to aid reversing and to flood the area behind the vehicle in the dark woods the vehicle would be working in. A 40″ curved double row Wilderness LED Lightbar was then fitted to the front of the rack which basically when switch on from the cab turns night into day. A Warn M9000-S Winch was fitted to a Mantec Bumper and wired via an isolator. To finish it off we fitted a Genuine Land Rover Snorkel and a set of BF Goodrich Mud Terrain Tyres. All this has turned this Defender into a serious bit of kit.